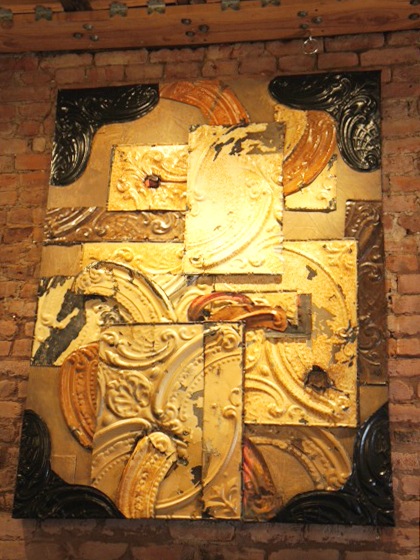 The first time I laid eyes on the piece, I was determined that soon enough, it would hang in the bar at Carpe Vino. “Shanghai Tin-Types” is a collage of salvaged, pressed metal panels—oxidized by the collective grit, grease and nicotine over a century of cladding the ceiling of Old Town Auburn’s most celebrated watering hole. The residue of a million cigarettes is rendered in a boozy, striated patina in muted tones of raw umber, sienna and ochre, seared wondrously into artfully arranged pieces. A loving tribute to the venerable Shanghai Restaurant and Bar—which closed in 2005 after being owned and operated by the same family for 109 years—this piece was created by Linda Pierce, co-owner of Sierra Moon Goldsmiths, a jewelry store across the street from Carpe Vino. Linda is a dear friend and an extremely talented jewelry designer and fabricator. I have always viewed her purely as an artist, a distinction she demonstrated conclusively in her execution of Shanghai Tin -Types. I coveted this piece for reasons far in excess of its exquisite composition and artistic allure. . .or the fact that it represents an important slice of both Americana and Auburn history. 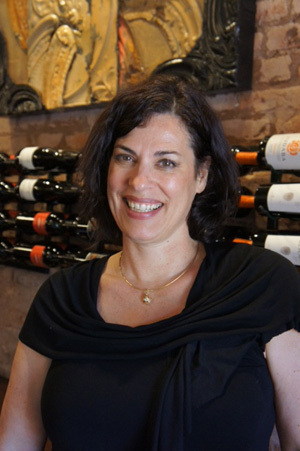 As a new business in Auburn nearly 10 years ago, our presence in the historic district was viewed with distain by our neighbor across the street, and we had to work through some irksome difficulties as we slowly gained traction during the early days of Carpe Vino. I have no wish to open old wounds by recounting the details, but suffice to say, we’re still very much in business and it has never been better. So, for me, Shanghai Tin Types serves as a symbol of Carpe Vino’s tenacity, perseverance and survivability. Acquiring “Shanghai Tin-Types” was absolutely essential, and the notion of owning a piece of the Shanghai launched me on a mission. Six years ago, when the owners held an auction to sell much of the Shanghai’s contents, I had no interest in even attending the sale. But now, I was compelled to own this remnant that Linda Pierce had transformed into a work of singular beauty. This was a quest more easily imagined than accomplished. Linda created her masterpiece for the 2011 PlacerArts “Think Outside the Box” annual show. Nearly 100 artists took up the challenge of creating one-of-a-kind pieces incorporating 12-inch square birch boxes provided by the sponsor. Entries were contributed by the artists, with proceeds at auction benefitting PlacerArts. There was an early buzz about Linda’s piece, with a number of deep-pocketed locals expressing interest. May 14th was the date of the live auction, but for several weeks in advance, bidders were invited to participate in a silent auction. The highest bid reached during the first phase would represent the starting bid for the live auction. I put in two bids for Shanghai Tin Types: first $250 and then $1,000, which was ultimately the opening bid for the live auction, and my firm statement that I was serious about taking the piece home. This is a detail of the tribute to Charles Yue, founder of the Shanghai Restaurant and Bar launched in 1896. The Shanghai closed in 2005, and the building was gutted and totally refitted as the new home for the Auburn Alehouse. On auction night, the program kicked off at 7 p.m., but Shanghai Tin-Types was the 65th item on the list, so it wasn’t until close to 10 p.m. that Auctioneer Dan Macon—also owner of Flying Mule Ranch—finally introduced the piece. By then, adrenaline was coursing through my then 60-year old veins at an unhealthy pace, but I was armed with a solid plan. The main gallery of 808 Lincoln Way was standing-room only, and many of the people in the room were aware of my keen interest in the piece and expected me to bid aggressively. I had something quite different in mind. Dan started the bidding at $1,050, which came instantly. I was seated, so I’m not sure how many people were bidding, but Dan moved up the action rapidly in $50 increments. The bid reached 1,500, and I remained silent. It shot past $1,700, and I sat motionless. Linda told me earlier in the day that she had dreamt her piece would sell for $3,840. Personally, I thought it could easily fetch $2,000, which was very near the threshold of what I had set as a spending limit. Within a short time, the pace of bidding slowed markedly as the action narrowed to two people; I remained resolutely mute. The room went quiet as the bidding appeared to have reached its zenith. In that instant of silence when the high bidder assumed the prize was his, I finally made my move and shouted, ”TWENTY-FIVE,” shattering the moment and startling my companion, Ellen, and nearly launching her out of her seat. My spur-of-the-moment strategy had been to make one bid, and one bid only when it was clear that Dan was about to close the action. By escalating the bid by $500, I hoped to disrupt the rhythmic flow and confuse the participants just long enough for the final gavel to fall. And it worked. Sitting next to me, my beloved, Ellen, grabbed me with a bear hug and said “I know you wanted it so badly. . .I’m so happy for you!” People standing nearby congratulated me, and after absorbing the win, I got up and greeted Linda with a hug and said, “So, where are we going for a drink?” I stood in line and paid for the piece, collected Ellen and we went across the street to the Monkey Cat where owner Jim Brill refused to let us pay for our celebratory beverages. My $2,500 bid was not only the high bid of the evening, it was the highest price ever paid for any “Think Outside the Box” piece in the six years of the competition. This was a juried show, and, oddly enough, Shanghai Tin Types was not recognized with any award. . .go figure. The piece that was named “Best in Show,” however, sold for less than $400. 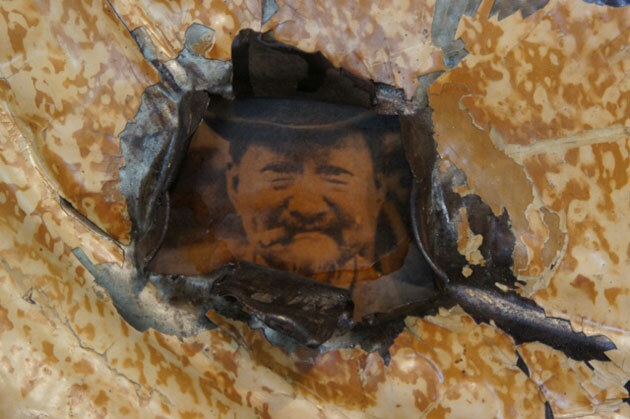 Gary and Jan Lord, founders and former owners of Sierra Moon, collaborated on the project, which pays homage to Charles Yue in an unusual fashion. . .his cigar chomping visage—rendered in sepia tone—peers through a jagged hole in the lower right quadrant of the piece. Head covered in a dapper bowler hat, he has every appearance of capably managing a rugged bar at the turn of the 20th century. You can view Shanghai Tin-Types any time Carpe Vino is open. It hangs on the brick wall near the bar when you enter the building.